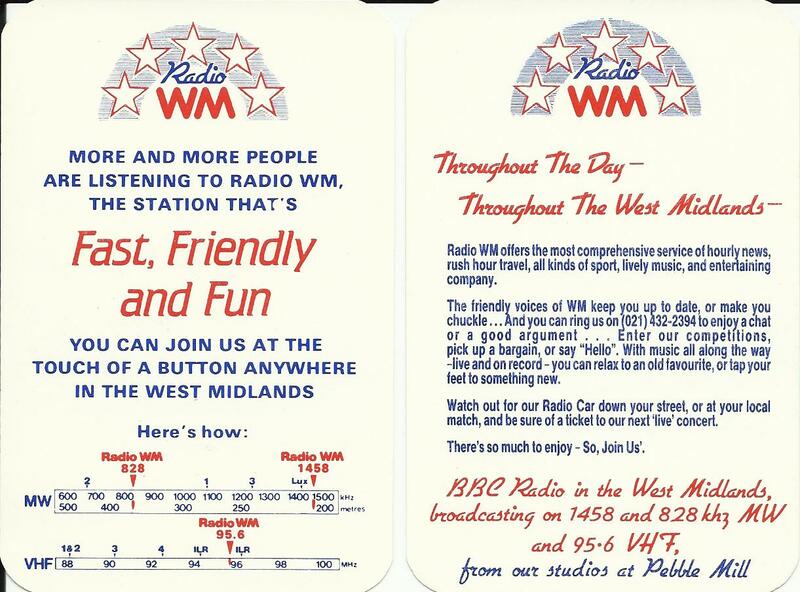 The Radio WM information cards were distributed to promote the station, and make sure people knew the right frequencies to tune in to. The cards were given out around the time of the official relaunch of the station with its new name – BBC Radio WM, instead of Radio Birmingham (which took place on November 23rd 1981), and were designed to publicise the additional medium wave transmitter on 828 khz at Sedgley, aimed at improving the signal in Wolverhampton and across the Black Country. ‎”Five Star Listening” was the tag line for the station, it was used before the official name change as well. From late 1980 onwards when the name Radio Birmingham was played down and the station started to refer to itself wherever possible as “206”. There was a lengthy discussion going on between BBC Local Radio HQ in London and the management at Pebble Mill about what the new name for the station would be. John Pickles was determined that the re-vamping of the station wasn’t going to be delayed forever by internal debate, and so the 206 strategy (the MW frequency) was adopted. Thanks to Stuart Gandy for making this card available, and to Tim Manning for providing all the information.